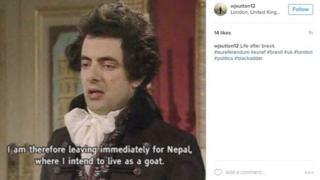 As the British people digest the vote to leave the European Union, a torrent of reaction has been shared on social media. Across the nation, people have expressed a range of emotions from joy to anger and from hope to fear. 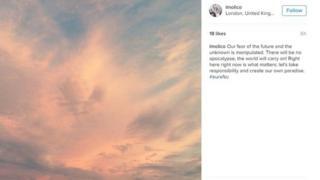 London-based Instagram-user Lmolico was among those posting positive messages after it became clear the Leave campaign had won the day. Brendan Hoey, a retired watchmaker from Torquay, shares her optimistic outlook. “I’m absolutely over the moon,” he said. In contrast, a Twitter-user from Tunbridge Wells in Kent, @chic77geek, posted a series of despairing tweets in which she laments: “I don’t believe in Britain anymore. What future does my son have now? I want to leave, devastated at this result #NotInMyName”. A breakdown of the results reveals some regional divides. In Scotland, there was a majority vote to remain in the EU putting it at odds with the overall UK vote. 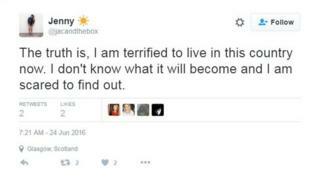 Jenny Cleeton a 22-year-old blogger from Glasgow, is worried about what the referendum result means for her future. “If we leave the EU, will that mean a second referendum in Scotland? Will our money lose all its value? I am completely unsure about what this means for my future,” she said. Although Cleeton voted to remain in the United Kingdom in the Scottish independence referendum in September 2014 she says she would choose to leave if offered the opportunity again. “The unity has gone. Why would I want to stay united to the southern part of the country where decisions are made that I don’t like and simply don’t understand,” she added. 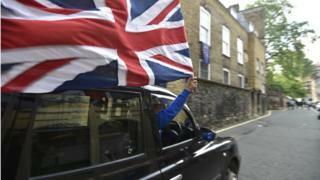 Northern Ireland also witnessed a majority vote to remain in the EU. Conor McGale from Omagh, Northern Ireland, is in his 40s and can remember when there used to be border checks between Northern Ireland and the Republic and frets that they may return. “It comes down to the simple fact that we are the ones with a land border with another EU country and we have the most to lose,” he said. In Wales, there was a majority vote to leave the EU with some pockets of strong support for the Remain campaign. Jordan Hill is a 20-year-old business and accounting student from Powys which registered a majority of 53.7% in favour of Brexit. “I got a happy shock when I woke this morning. We have been an outcast in Europe and I don’t see us as likely to thrive within it. Although the vast majority of English counties came out in support of the Leave campaign the capital, London, stood out, with most boroughs predominantly voting to remain. Social media in the capital in the hours following the result was dominated by posts lamenting the success of the Leave campaign.